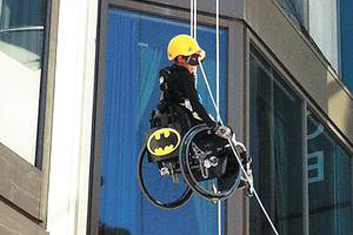 This past October, Michelle Amerie, a member of our Abilities family, completed the Easter Seals Drop Zone challenge. Casting fear aside, she rappelled down a 32-story building. It was all for a good cause—proceeds from the fundraising event are used to support children and youth with disabilities. Since 2005, the Drop Zone has raised more than $4.8 million for Easter Seals. To watch the video of Amerie’s amazing descent, go to tinyurl.com/ michelledrops. For more on the Drop Zone, visit thedropzone.ca. GOING UPAccording to an article in the UK’s Daily Mail, a wheelchair user in Voronezh, Russia, constructed a DIY winch lift to get up to his fifth-floor apartment. Apparently, Dmitry Bibikow had been promised that an elevator would be installed in the building shortly after he moved in. Six years later, there was still no elevator in sight. Through the years, the former mountain climber was forced to rely on other people to get in and out of the building, or remain confined to the apartment. 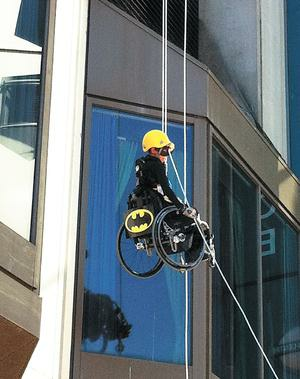 Eventually, Bibikow and his friends constructed a device that cranks him and the chair up the front of the building. His wife brings him into the apartment through the balcony. Scary stuff. A class in advanced computing at Stanford University in Palo Alto, California, may make it easier—and less expensive—for people with vision disabilities to write Braille. During a summer course at the university, undergrads from across the U.S. completed research assignments in a battle to take home the title of “Best Android Application.” The winner, Adam Duran, along with his mentors, created a touchscreen tablet Braillewriter, which turns a standard tablet PC into a Braille keyboard. While conventional devices for typing Braille work well enough, they are bulky and can cost upwards of $6,000. Tablets are less expensive and are also customizable. But how can people with vision disabilities find the keys on the flat, glass surface of a tablet? Duran solved this problem by creating keys that find the fingertips instead—users touch eight fingertips to the screen and the keys orient to the fingers. The device isn’t on the market just yet, but the team is committed to getting it to end users in the near future. For more info, visit tinyurl.com/brailletablet.